Please view the technical specifications of the specific product you are interested in. What are knife blades made of? Stainless or carbon steel? All knives are made from stainless steel. All steel contains carbon which adds hardness to the blade. We use many different types of stainless steel. Please view our information about knife metals for more details. What is the angle on the knife edge? View technical specifications for the specific product you are interested in. What’s the difference between the different knife lines? Are the knife blades single ground or angled on both sides? Knives are ground on both sides for right-handed and left-handed use. What is the Rockwell scale? The Rockwell scale is a hardness scale based on indentation hardness of a material. The Rockwell test determines the hardness by measuring the depth of penetration of an indenter under a large load compared to the penetration made by a preload. There are different scales, denoted by a single letter, that use different loads or indenters. The result is a dimensionless number noted as HRA, HRB, HRC, etc., where the last letter is the respective Rockwell scale. HRC is the scale for knives. 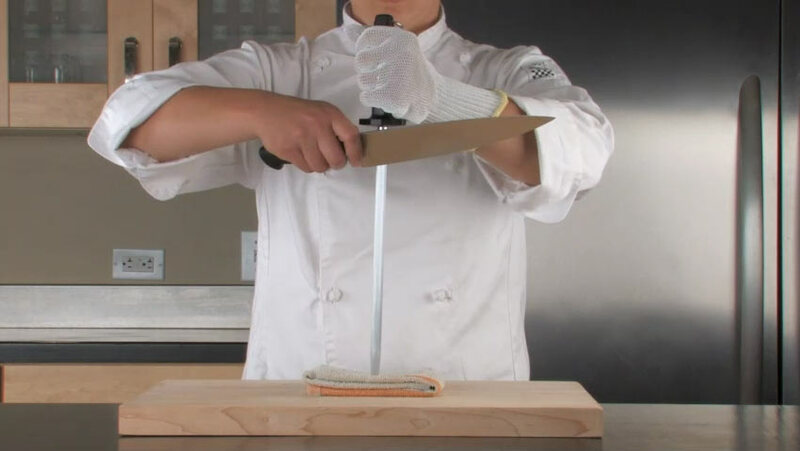 MX3® knives are HRC 60-62. After each use, carefully wash cutlery by hand with warm water and mild- to medium-strength soap; rinse and thoroughly dry it with a soft towel.Cutlery should never be washed in a dishwasher: the intense heat and radical temperature changes may cause the handle to deteriorate; the blade edges will become dull through rubbing against each other; and caustic soap will cause staining and pitting of the blade. Is the Santoprene® handle affected from the dishwasher heated drying cycle? Do knives or knife sets come with knife guards? No. Knife guards can be purchased separately. Have this link to the knife guards page of website. What knives are full tang? What to use each knife for? Do the knives come sharp or we have to sharpen them? How do I remove rust/oxidation stains? The oxidation on the knives should easily come off with a light abrasive with like Bar Keepers Friend or a combination of water and baking soda. Although this is unusual, high-carbon stainless steel can sometimes have this happen over long exposure to moisture but is easily remedied. An even easier model is soaking in white vinegar for 5 minutes and then scrubbing. What is the HRC the knife lines? Genesis®, Renaissance®, ZuM® and Asian – HRC is 56+/-1. Millennia®, Praxis, and Ultimate White – HRC is 53~54. For additional technical specifications please view the specific item you are interested in. How do I maintain the wood handle? 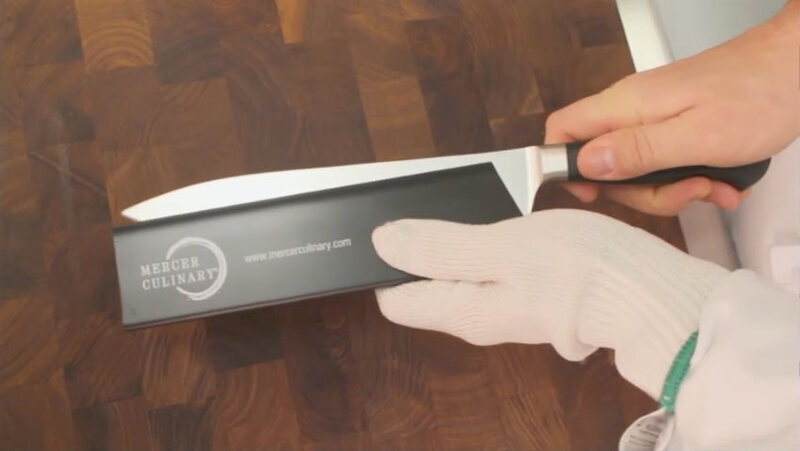 ALWAYS CLEAN THE HANDLE THOROUGHLY AFTER CUTTING RAW FISH OR POULTRY. Sanitize your handle by wiping down with mild dish soap and water. Dry thoroughly. DO NOT wash your wood handle knife with harsh detergents of any type. DO NOT put your wood handle knife into dishwasher. Can the handle be replaced? The handle cannot be replaced. Does the Santoprene® handle retain odors? Are the handles on Millennia® knives plastic? They are made of a combination of Santoprene®, a thermal plastic rubber and polypropylene. How do I choose a sharpener? 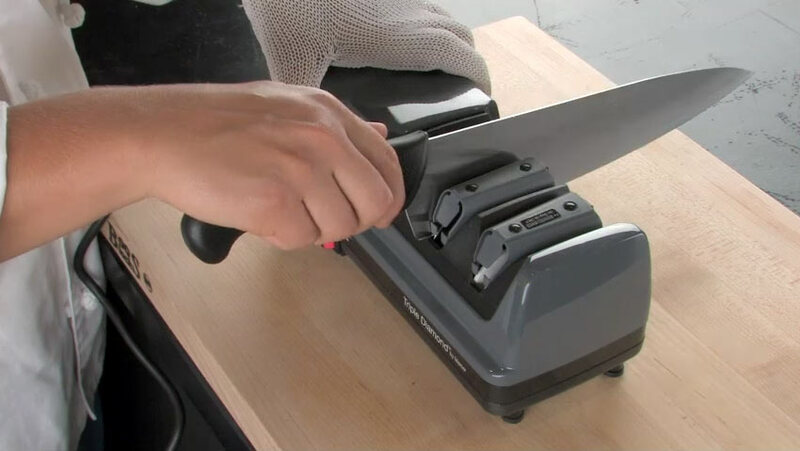 What’s the difference between sharpening and honing? Is the three stage sharpener suitable for commercial applications? What is the grit per stage on the three stage sharpener? What’s the difference between the steels? How do I hone a knife? How do I use a handheld sharpener? How do I use an electric sharpener? Does “glass reinforced nylon” mean it’s made of glass? Fiberglass is added to the nylon to make it stronger and more heat resistant. At what temperature do Hell’s Handles get hot? The handle absorbs 50% less heat staying cooler to the touch. The surface temperature of the handle will be predicated on the length of time and temperature it is exposed to. 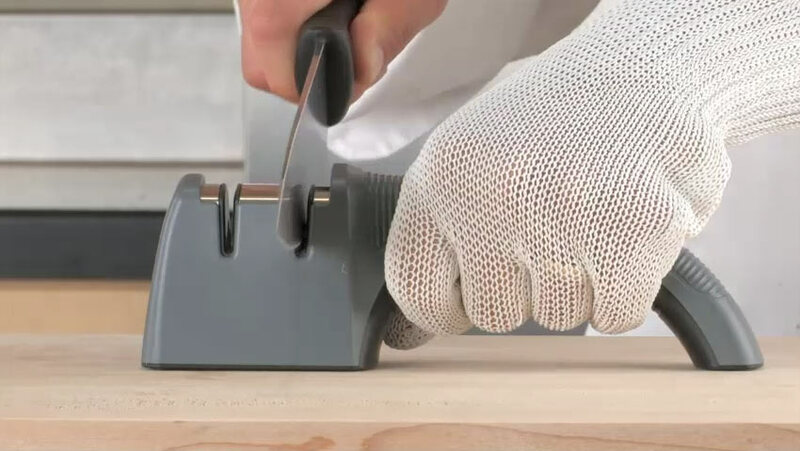 Is the magnetic board intended to be used for cutting? The magnetic boards should never be used for cutting. These are meant for knife storage. Can the board hold more knives? The number of knives the board can hold is dependent on the size of the knives you would like to store on it. Can magnetic board be wall mounted? Is the magnet strong enough to hold up a cleaver? 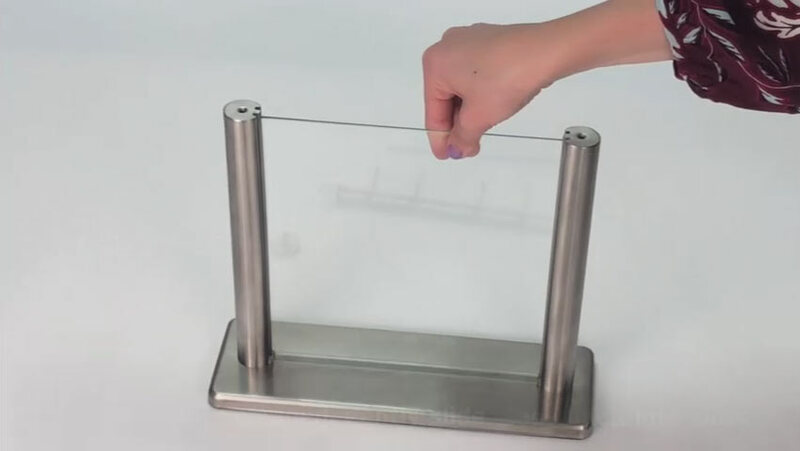 The magnets cannot support the weight of a cleaver. Does the kind of wood have an effect on the strength of the magnets? The magnet strength is the same for all the woods. Are the magnets in strips or is the whole board magnetized? The magnets are in strips. Are knives from kits sold separately? Yes. You can buy the knives individually. What other knives will fit in the glass block? The block will not hold anything longer than an 8″ knife. In regard to width, it will depend on the knife you are interested in storing. Can I purchase the wood block separately? Wood blocks are only sold as a set with the knives. Magnetic boards can be purchased separately. Is the glass that holds the knives removable in order to wash them? Are knife cases machine washable? What type of fabric are cases made of? Exterior is 600D Polyester. Some cases have lining which is made from nylon. What material is the inside lining of the knife cases made of? What are the dimensions of the knife cases? How many knives do the knife cases hold? This is dependent on the knife case you are selecting and the number of pockets it has. What is the warranty for the backpack? All cutlery storage cases have a 90 day warranty. Does the backpack fit a laptop? The backpack can fit a laptop. Are the shears strong and sharp enough for cutting chicken bones and meat? The shears are stong and sharp enough to cut poultry and meat. Shears will rust if not cared for properly. Please view the technical specifications of the product you are interested in. Where are products (other than knives) manufactured? Please see the technical specifications for the specific item(s) you are interested in. How do I apply the warranty? Are both sides sealed on the knife sheath? Knife sheath is sealed on both sides. Knife guards are open on one side. How do I care for apparel? If a product is NSF certified it complies with the NSF sanitation standard. Manufacturers, regulators and consumers look to NSF International for the development of public health standards and certification programs that help protect the world’s food, water, consumer products and environment. They work to protect and improve global human health. As an independent, accredited organization, their Standards Group facilitates the development of standards, and their Service Groups test and certify products and systems. The organization was found in 1944 as the National Sanitation Foundation. The name was changed in 1990 to NSF International as they expanded beyond sanitation and into global markets. The letters in the name do not represent any specific words today. How do I use a Mercer Knife Guard?